Endovenous laser therapy is an alternative and more cosmetic way of dealing with varicose veins. A fine laser fibre is passed up the vein under ultrasound guidance. The ultrasound guidance ensures that only the correct vein is treated. The vein wall is gently heated permanently shrinking and destroying the vein. Some of the key differences between laser therapy and stripping for varicose veins are shown in Table 1 below. Endovenous laser therapy is a scar-free procedure that can be performed entirely under local anaesthetic in the majority of cases. It is applicable to nearly all patients including those with pre-existing medical conditions or medications preventing the administration of a general anaesthetic. Patients who have previously had unsuccessful varicose vein stripping can also have endovenous laser therapy. Cosmetic outcomes from laser are far superior to stripping. Patients report minimal to no bruising, swelling or pain following the procedure. Many return to normal within a few days. 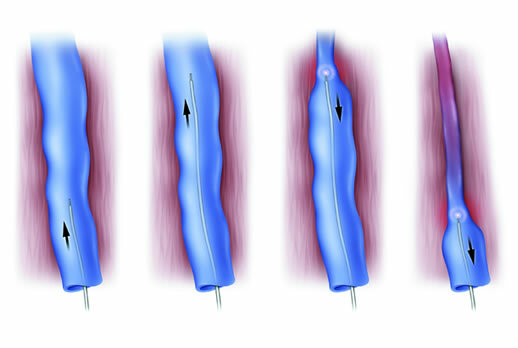 The risk of the veins coming back is currently believed to be less than 7% (7 out of every 100 patients) at 4 years, far superior to the traditional stripping operation. Endovenous laser therapy is a quick, minimally invasive laser procedure that leaves no scar, has a short and relatively pain-free post-operative recovery period, and may be performed under local anaesthesia. The treatment itself will take less than one hour The area of the affected leg is anaesthetised locally and a thin laser fibre is inserted into the abnormal vein, delivering the laser energy in short pulses. The laser energy heats the vein causing it to shrink and seal off, preventing blood from entering. During the procedure, you will be given a pair of special glasses to wear to protect your eyes. This is just a precaution against accidental firing of laser energy outside the body. Walking immediately following the procedure is encouraged and normal daily activity can be resumed immediately. About 1 in every 5 patients may experience bruising and soreness for 3-5 days after the treatment that is usually improved by walking or oral pain relief medications.